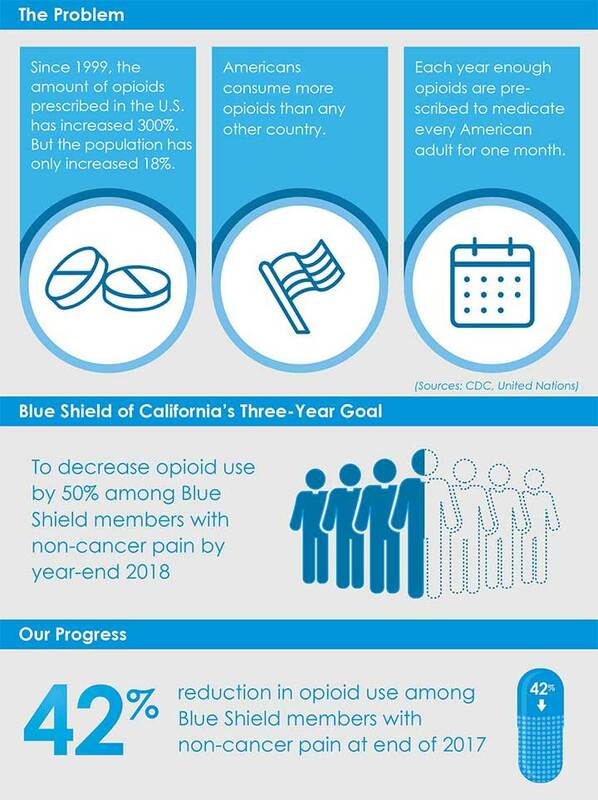 BY STAFF - Blue Shield of California's efforts to help solve the opioid epidemic continues to make significant strides. The nonprofit health plan launched its Narcotic Safety Initiative in 2015 with a lofty goal of reducing the overall opioid consumption among its members with non-cancer pain by 50 percent by end of 2018. Our latest results (year-end 2017) show we’ve already decreased that rate by 42 – well on our way of meeting our goal. Our initiative works to achieve prudent prescribing and proactive management of opioids; increase access to programs that manage pain, addiction and substance abuse; and reduce fraud, waste and abuse. Below are more details.